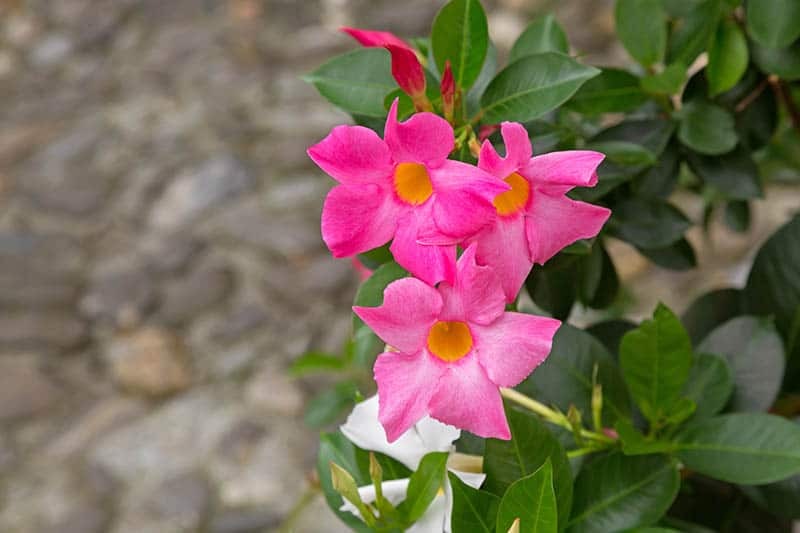 The Mandevilla Vine is a versatile plant that can be kept as a houseplant but is more commonly seen climbing up pergolas, along trellises or fences, or flowing out of hanging baskets. While the foliage is attractive, the main event is the large abundance of vibrant, trumpet-shaped flowers that bloom from spring right through to fall. If kept inside year-round, the plant can do well on bright windowsills or in sunrooms, though it rarely flowers in these conditions. 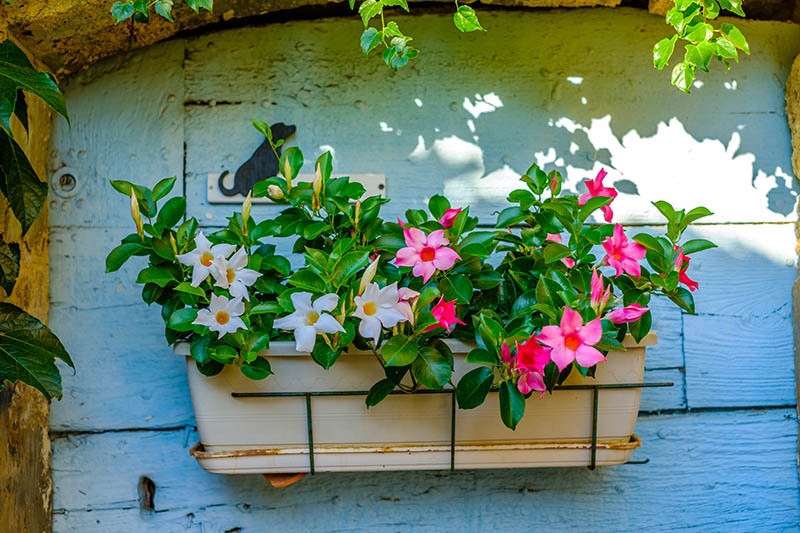 Whether you choose to house your Mandevilla Vine in a container pot or a hanging basket, the soil you use needs to be carefully considered. Choosing the correct soil for your vine will be one of the most important aspects of caring for your plant. The ideal soil will result in a healthy vine that looks lush and full. Mandevilla Vines like to be in loose, well-draining soil. Select a good potting soil that is compost-based, or a peat moss, and add sand to help improve aeration. You could use two parts potting soil or peat moss to one part builders’ sand, or, alternatively, use all three mediums in equal measure. This plant performs best when its soil is continuously moist but not wet. Give it a good drenching and then, wait until the soil is almost dry to the touch before watering again. During the growing season, a heavy watering once a week will probably be about right, but this should be adjusted depending on light, temperature, plant size, and variety, so do check on the condition of your plant's soil before adding more water too it. The Mandevilla Vine is susceptible to root rot, so be cautious when watering to avoid this problem. This is also where the well-draining soil comes into play, helping the water flow through to the bottom of the container and out of the escape holes, so the roots aren’t sitting in standing water. When watering your vine, you should shower the foliage as well as the soil. This helps to remove any pests that might have made a home on your plant but also gives the plant an opportunity to absorb moisture through the leaves. When doing this, be sure to use a light shower or drizzle function on your hose, as a strong force of water could harm the flowers. 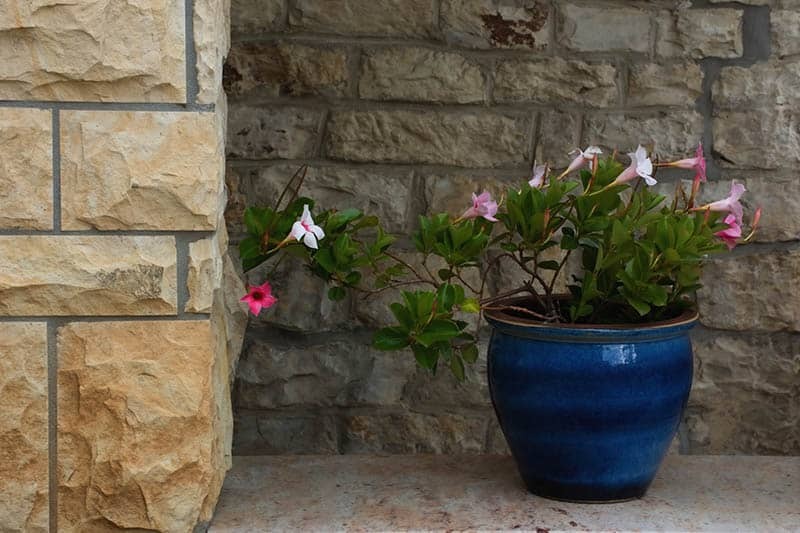 Mandevilla plants like a good balance of bright, indirect light and shade. Too much direct sunlight will cause the plant to become scorched, while too much shade will stunt plant growth and inhibit flowers from blooming, so choose the positioning of your plant with this in mind. The ideal outside spot for your Mandevilla Vine is a location that gets morning sun but is shaded and, thereby, protected from the strong sun in the afternoon. This balance will allow your plant to thrive. This plant enjoys warmth, with temperatures ideally between 60-80° F. If outside temperatures drop any lower than 50° F, then it is time to find a home for your plant indoors. The Mandevilla Vine cannot survive overnight temperatures of 40° F, so be sure you don’t leave it too late and lose your plant. Once inside, normal home temperatures will be fine for the plant. It can return to life outside once temperatures are consistently reaching a minimum of 50° F.
The Mandevilla Vine likes moderate to high humidity. When kept inside as a houseplant, it will benefit from a light water misting spray, or the use of an electric humidifier to prevent it from drying out. This plant is also able to absorb moisture through its leaves. If air becomes too dry inside, then the plant can dry out, so be sure to put steps in place to prevent this from happening. Your Mandevilla Vine will need to be fed fertilizer during its growing period to ensure the development of an abundance of flowers. After bringing your plant home from the garden nursery, it usually won’t require to be fed for around three months, as the soil will likely already contain a slow release fertilizer. Refrain from adding any more fertilizer to the vine as this can result in fertilizer burn. Once you have had the plant for three months, you can begin to feed the plant, or some growers simply add an organic-based topsoil to the container, which will provide enough essential nutrients. During times of heavy growth and flowering, you may need to feed the plant on a weekly or bi-weekly basis (New York Botanical Garden). Use a water-soluble fertilizer or slow-release fertilizer and monitor the plant for its reaction. If any undesirable effects occur, then you can adjust your feeding schedule accordingly, or try a different type of fertilizer. At the end of summer, your plant will benefit from a final feed which is high in phosphorus. This feed will see the vine through winter as it should not be fed again until spring. 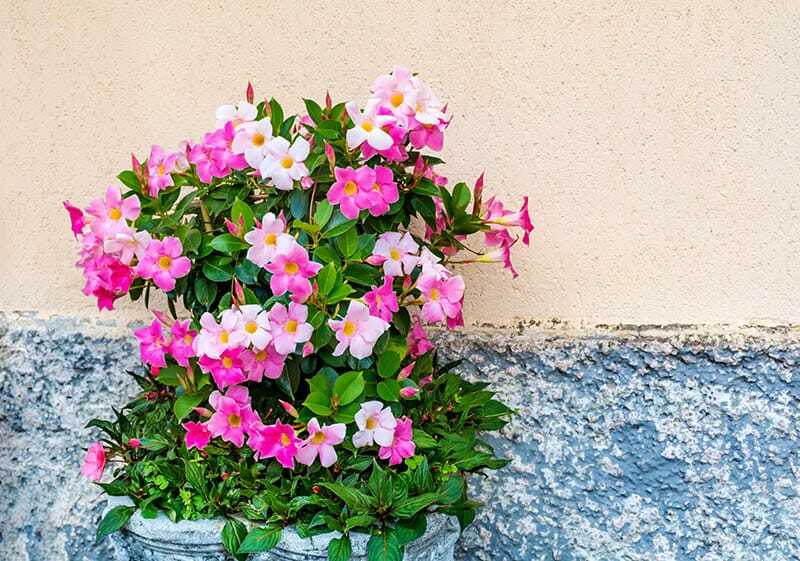 The Mandevilla Vine must be potted in a portable container, such as a pot of hanging basket, and not directly into the ground. This is because the plant does not fare well outside over winter and will need to be transported inside to be kept alive. Ordinarily, you will need to repot your vine as soon as you bring it home from where you have purchased it. Be careful when selecting a container for your vine, choosing one with a little extra space around the edges than the current pot it’s in. Using a container that gives the roots too much room to grow means the plant will put all of its efforts into growing roots instead of producing flowers, resulting in poor flower growth. However, you still want to allow the roots a little space to spread, so don’t be too conservative when selecting a pot. Mandevilla Vines will need to be repotted every year or two, and it’s best to do this in the spring. As fast growers, the roots can become pot-bound quite rapidly. When you notice this happening, repot the vine by selecting a new pot that is just an inch or so larger in diameter than the current pot. Pad the edges with fresh soil and transport the plant from its current pot to the new pot, rubbing the roots gently between your fingers to encourage them to spread in their new home. Try not to use a pot with more depth, as this can negatively impact flower production. Repotting is also a good opportunity to remove any dead flowers or foliage from your plant. This will ensure that the plant's energy is directed correctly instead of to areas of the plant which are damaged. This plant grows rapidly and, therefore, will need pruning if you want to control its growth. If the plant begins to look messy or is crowding your other plants, you can prune it back as much as you like until it is the size you want it to be. 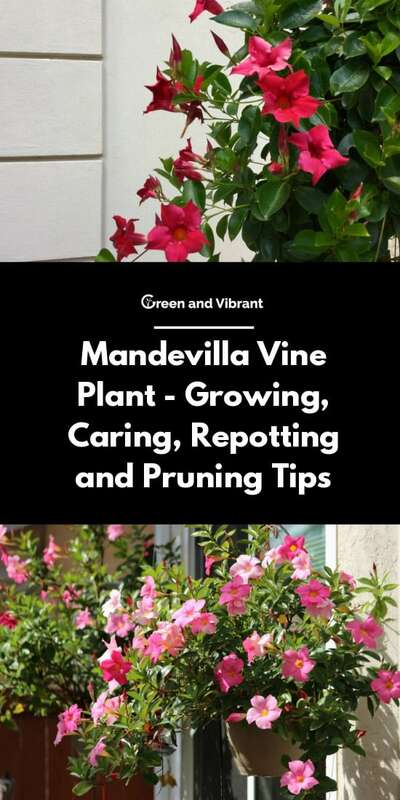 Don’t be scared to over prune, as the Mandevilla Vine responds well to aggressive pruning and will follow up pruning with vigorous growth and new blossoming flowers. When pruning, always wear protective gloves as the milky sap contained in the leaves and stems can cause skin irritation. 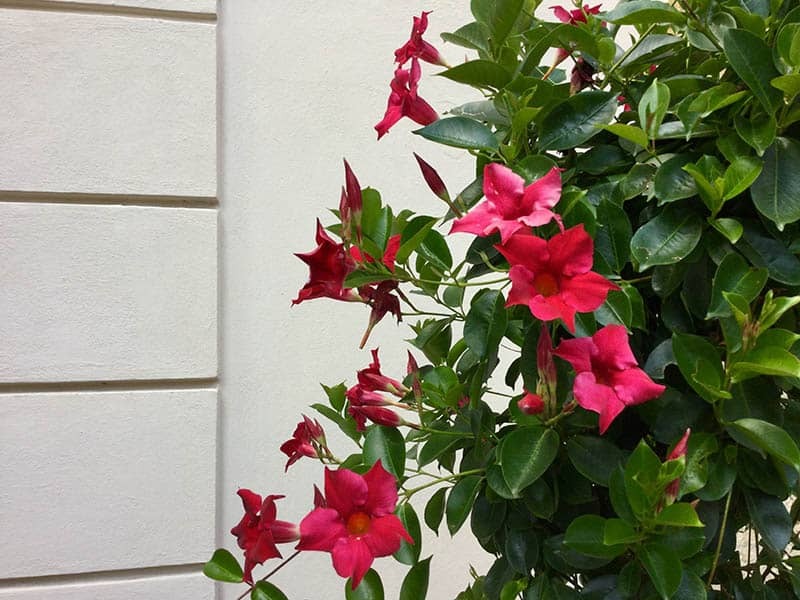 If you are happy with the spread of your Mandevilla Vine during its time outside, then there is no need to prune it. If you plan to bring the plant inside over winter, it will almost certainly need to be aggressively pruned in order to easily transport it into your home, and also to fit it into the required space. Cut it back as small as you need to. If you have a very large vine and need to prune the majority of it off, then this can seem quite a daunting task. However, even if you cut it back to just a few inches from the soil, it will still return to its former size from new rapid growth when next spring comes around, giving you yet again a beautiful and vibrant plant to enjoy throughout the growing season. Try not to be too cautious with your pruning; it won’t harm the plant in any way, and it’s important that the vine is a size which you are able to live with in your home throughout the winter. If you want to feature your vine as a houseplant over winter (as opposed to putting it in a rarely used room to rest), you will want to leave some of the foliage and flowers intact to ensure it is visually attractive. Very little growth will occur once you bring the plant inside. Bring your Mandevilla Vine inside once temperatures outside drop to below 50° F. Be sure to check the plant thoroughly for pests before bringing it inside, as these can spread to other houseplants. Common pests on the Mandevilla Vine include mealybugs, aphids, scale, whiteflies, and spider mites. Check under the leaves, as well as on top, on flowers, and stems. Some people like to have the vine as a houseplant during winter, in which case, ensure it gets bright but indirect light, is kept at usual home temperatures of between 60-80° F, and keep the plant away from cold drafts or excessively dry air. The plant will grow very slowly during this time, and the aim is simply to maintain it rather than developing it, so don’t use any fertilizer once the vine has been moved inside, and dramatically reduce how frequently and how heavily you water it. The Mandevilla Vine can return outside and resume normal care when spring arrives. Alternatively, you can bring the vine inside to a basement or garage over winter. This will involve putting the plant into a protective environment, which will allow it to become dormant. To do this, prune the plant back to around a foot in height and move the plant into your chosen place once the temperature outside is quite cool. You will need to ensure that your garage or basement temperature stays above 50° F during winter; otherwise, the plant will die. At this point, some people choose to cover their Mandevilla Vine with a plastic bag, though it’s also acceptable to leave the plant uncovered. Whichever method you choose, you’ll need to ensure the plant is in total darkness during its time inside. The removal of sunlight from the vines life will make it go dormant. You can leave your plant in this state for the duration of winter, checking on it occasionally to see if the soil is dry. If it is, you can water it just a little amount to keep it alive. This process allows the plant to rest completely. In February or March, assess the plant’s condition for disease and damage, removing any parts of the vine that have died. At this point, you can repot the plant if necessary, and resume feeding and watering the plant (Royal Horticultural Society). Following this, the plant should bounce back to life and perk up considerably. When spring comes around, you will need to gradually re-introduce the plant to light and heat. Put it outside on bright and warm days in April or May, remembering to bring it back inside overnight when temperatures drop. During this time, the plant will gradually acclimatize to life outside. Any winter growth may die during this transition, but this is not a cause for concern and is entirely normal. It will resume its usual rapid growth pattern once it properly settles back into its home outdoors As soon as the weather becomes more consistently warm, with a minimum temperature of 50° F, the plant can return to its position outside on a more permanent basis. Foliage that is turning yellow is most commonly a result of lack of nutrients, but this could be down to several possible factors. Most commonly, overwatering is to blame for this problem. Too much water will saturate the roots of the Mandevilla Vine and prevent them from being able to absorb water or nutrients. Poor drainage is a very similar problem. If the soil cannot effectively drain, then the roots will be sitting in wet soil and become saturated, leading to an inability to absorb water and nutrients. These issues will eventually lead to root rot, which will kill the plant, so yellow leaves should be addressed early to give your plant a greater chance of survival. Too little water can also cause yellowing leaves because the water is the vehicle that carries the nutrients to the plant via the roots. If the plant is not getting enough water, then the plant will not be absorbing any food or drink. Nutrient-deficiency can also be caused by a lack of, or improper use of, fertilizer. You can figure out which nutrients are lacking from your plant by noting the process by which the foliage turns yellow. If younger leaves turn yellow first, this points to the plant being deficient in iron. If the older leaves are affected first, then this is more likely a lack of zinc, nitrogen, or manganese. By determining which nutrient is missing from your Mandevilla Vine, you can select a more appropriate fertilizer to deal with this. Brown spots on the leaves of your plant are ordinarily the result of disease or pests. You can check your plant for pests by inspecting it closely, looking for the bugs themselves, as well as other clues, such as holes in the foliage, webbing, or residue that pests have left behind and develops fungus. Pests can also turn the leaves of your plant yellow as the feed on the sap, depriving the plant of nutrients. In the case of pests though, yellowing leaves will be accompanied by other symptoms. If you identify pests on your plant, first try to remove them with a strong blast of water from a hose. Repeating this daily for a week is usually enough to rid the plant of a minor infestation. If the pest problem is more severe, try using neem oil. You can buy neem-based sprays, which are organic and not harmful to the environment or beneficial to insects. Alternatively, you can make your own for a more natural solution. Buy pure organic cold-pressed neem oil; it is fairly inexpensive and can be easily bought online. Neem oil should be diluted before spraying on any plants, but it is not water-soluble. To make your spray, first mix one quart of water with a squirt of mild dish soap (around half a teaspoon); this will allow the neem oil to mix with the water. Add one teaspoon of neem oil and mix. Use the spray liberally on your Mandevilla Vine every day for a week. This should rid your plant of any pest problem, so the use of pesticides is rarely required. How is your Mandevilla Vine doing? Feel free to ask any questions in the comments below, and don’t forget to share this page with others who might find it useful!